Taking just a few moments to breathe deeply and fully every day gives us more energy, improves our mood, cleanses the body of toxins, staves off disease, and helps us to stay active. Here's a five step plan to get the most benefits from every breath. The first step to correct breathing is efficient and optimal posture. We need to adjust the architecture of the body to allow the lungs to fully expand. Decide if you feel most comfortable lying down on your back, sitting, or standing. If lying on the back, choose a supportive surface such as a yoga mat placed on the floor. Let the body fully relax into the mat and notice the natural curves of the spine. If sitting down, choose a supportive chair or sit cross-legged on a yoga mat with the back against the wall. Now that you have the body in correct alignment, relax all the muscles of the face, neck, shoulders, and ribs. With these areas relaxed, the nasal passages, throat, chest, and muscles between the rib bones relax as well, and you are ready to receive as much air as your lungs can hold. While the lungs are the primary organ for breathing, other parts of the body get involved as well. As the lungs expand, the belly expands, the chest rises, and even the collar bones lift slightly. As we exhale, the collar bones drop, the chest falls, and the navel moves back toward the spine when the belly relaxes. When all three of these areas move with the breath, we call this a Full Complete Breath. There is a biological difference between breathing in and out through the nose and in and out through the mouth even though both breathing mechanisms involve the lungs. When we breathe in and out through the nose, we actually stimulate the brain. The left nostril is connected to the right side of the brain (the creative, big-picture side of the brain) and the right nostril is connected to the left side of the brain (the analytical, detail-oriented side of the brain.) By breathing in and out through the nose, we actively engage the entire brain. When we bypass the nose and breathe in and out of the mouth, the brain is less stimulated. Breathing in and out through the mouth is a good option when we are overheated or when we encounter sizzling summer temperatures. This is because breathing in and out through the mouth is an excellent way for the body to release excess heat quickly and effectively. Depending on your needs, you can use three different techniques for three different benefits. The relaxation response is triggered by belly breathing. To get a sense of this technique, place both hands on the belly. When you breathe in and out, allow most of the body expansion to happen in the belly rather than the chest. This is a technique to practice when we feel nervous, fearful, or stressed. The breath is also a great tool to give us some added pep in our step. While belly breathing helps us calm down, concentrating more of our breathing movement in the chest stimulates the nervous system. To receive this benefit, place both hands on the heart and concentrate most of the body movement associated with the breath in that area. This technique works if you feel tired or mentally or physically depleted. Breath is, of course, an integral part of any workout. As a general rule, breathe in when you expand any part of the body (for example, lifting the arms up overhead) and breathe out when you contract any part of the body (for example, curling the arms toward the body with weights in the hands). This lets the breath act as a tool to align with and support our physical movements. Breathing is one of only two actions the body does consciously and subconsciously. (Blinking is the other one.) As a result, we often take conscious breathing for granted, though it can work wonders for both our mental and physical health. It's a tool we can use and a barometer of how we're feeling. Use it wisely with the steps and techniques above. 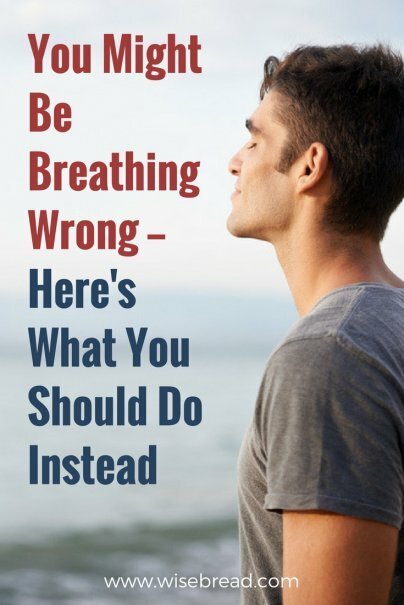 Have you tried to improve your breathing? Please share in comments!